pertaining to the carpus, or wrist. carpal tunnel syndrome a symptom complex resulting from compression of the median nerve in the carpal tunnel, with pain and burning or tingling paresthesias in the fingers and hand, sometimes extending to the elbow. The disorder is found most often in middle-aged women. Excessive wrist movements, arthritis, hypertrophy of the bone and connective tissue in acromegaly, and swelling of the wrist can produce the carpal tunnel syndrome. Treatment is usually conservative and consists of splinting the wrist to immobilize it for several weeks until the irritation of the median nerve has healed. In severe cases surgical resection of the carpal ligament is helpful. Carpal tunnel syndrome. 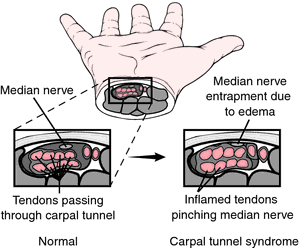 Entrapment of the median nerve in the carpal tunnel space. From Frazier et al., 2000. /car·pal/ (kahr´p'l) pertaining to the carpus. A bone of the carpus. 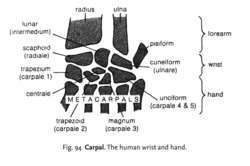 Pertaining to the wrist or wrist bones (carpals). Fig. 94 Carpal . The human wrist and hand. any bone present in amphibia, reptiles, birds and mammals in the part of the forelimb attached to the radius and ulna. Carpals articulate distally (see DISTAL with the METACARPALS. There are eight carpals in the human wrist. are located between the radius and ulna and metacarpals. Typically, there are six to eight bones, depending on the animal species, arranged in two rows and numbered from medial to lateral. See Table 10.
see carpal tunnel syndrome (below). at parturition the fetus is presented with the carpal joints flexed, thus increasing the diameter of initial parts entering the pelvic canal, resulting in dystocia in some patients. see chip fractures, slab fracture. seen in young puppies, particularly Doberman pinschers and Shar peis; the carpi remain slightly flexed when standing and the paws are deviated inwards. a group of vibrissae located on the posterior aspect of the forelimbs of cats, sensitive to touch. See also tactile hair organ. common synovial sheath in the forelimb of the horse, shared by the superficial and deep flexor tendons as they pass through the carpal canal. the osseofibrous passage for the flexor tendons and median nerve, formed by the flexor retinaculum and the carpal bones. a complex of signs resulting from compression of the median nerve in the carpal tunnel. In horses there is lameness with pain on extreme carpal flexion. There are no lesions on the anterior carpal bones. Q. what can i do to help my capentunnel without surgery? A. a good friend of mine is a bike racer and did the surgery- it's not a bad solution as it seems...but you can try and put on a splint to stabilize the wrist. The splint is worn at night for several weeks. If this does not help, you may need to wear the splint during the day. Hot and cold compresses may also be recommended. There are many ergonomic devices that can be used in the workplace to reduce the stress placed on the wrist. These include special keyboards, cushioned mouse pads, and keyboard drawers. Make sure the keyboard is low enough so that the wrists aren't bent upward during typing. You may also need to make changes in your work duties or recreational activities. An epidemiologic study of the carpal tunnel syndrome in an adult female population. High-resolution sonography versus EMG in the diagnosis of carpal tunnel syndrome. An evaluation of gender, body mass index, wrist circumference and wrist ratio as independent risk factors for carpal tunnel syndrome. Utility of nerve conduction studies for carpal tunnel syndrome by family medicine, primary care, and internal medicine physicians. Tobacco, caffeine, alcohol, and carpal tunnel syndrome in American industry. No studies with adequate size on the efficacy of conservative management of carpal bossing exist. Surgical management of symptomatic carpal bossing has evolved greatly since it was first described by Carter in 1941 who suggested prompt recurrence advocating against surgery. The role of conservative management for the symptomatic carpal boss deserves further exploration. Incidence of carpal boss and osseous coalition: an anatomic study. The carpal boss: Surgical treatment and etiological considerations. Carpal bossing with capitate-trapezoid fusion: a case report.